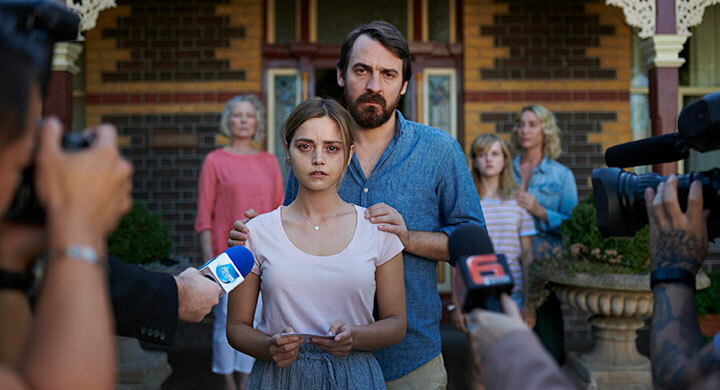 New parents Jenna Coleman and Ewen Leslie face unthinkable tragedy in four-part BBC psychological drama The Cry – but is all as it seems? Leslie, director Glendyn Ivin and executive producer Claire Mundell reveal the makings of this emotionally complex miniseries. It all started with a book. Claire Mundell picked up the manuscript for Helen Fitzgerald’s novel The Cry long before it was published in 2013 and immediately recognised its potential to be transformed into a psychologically and emotionally gripping television series. The story sees Joanna and husband Alistair travel with their newborn baby from Scotland to Australia to see Alistair’s mother Elizabeth and to fight for custody of Alistair’s daughter Chloe against his ex-wife Alexandra. But after they arrive down under, their lives are transformed when their baby goes missing. Brimming with dilemmas, moral ambiguity and crimes that are relayed through a family setting, it also portrays the intense strain new parents face, with Joanna seemingly struggling with post-natal depression, exhaustion and loneliness while Alistair juggles the demands of his high-flying political career. Mundell was instantly hooked by the “compelling” story. “It takes us behind the scenes of an unthinkable situation and it allows you to vicariously experience how these characters react to it and try to manage the situation they’re in,” she says. The project was in development with the BBC for several years until last July, when a four-part miniseries was given the greenlight with just one script in place. Now, just over 12 months later, The Cry is launching on BBC1 this Sunday. It will also air in Australia on the ABC, with DRG distributing the drama internationally. Getting the series on air in such a short timeframe is an impressive achievement by the team behind the production. Not only did writer Jacquelin Perske need to complete the scripts, but producer Synchronicity Films needed to lay out exactly how it would tell this story, which is split between Glasgow in Scotland and Melbourne in Australia, factoring in things such as casting and location scouting down under – a country in which the company had never worked before. Pre-production began in Australia at the start of 2018, with filming in Melbourne commencing in early February. Shooting shifted to Glasgow from the end of March before wrapping in May. Executive producer Mundell and producer Brian Kaczynski had flirted with filming in South Africa to save time and money, while working in a country with a timezone much closer to the UK’s. But their desire for authenticity – Fitzgerald’s book was set in Melbourne – meant they pulled out all the stops and headed to Australia. Their first trip last autumn involved scouting locations, meeting potential production partners and beginning their search for talent, both in front of and behind the camera. 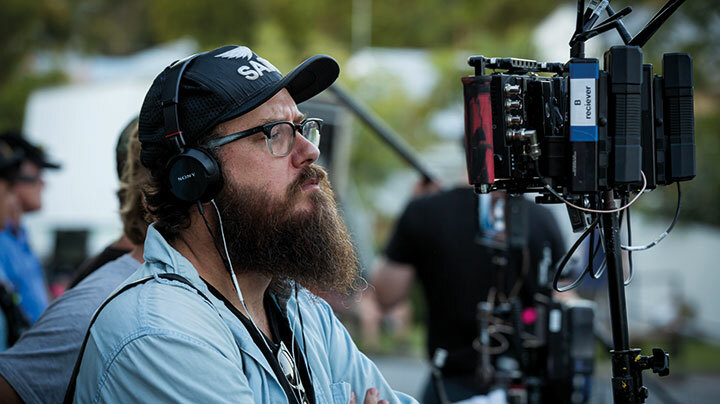 December Media came on board as a local partner and, once it was decided that the first leg of filming would take place in Melbourne, it then made sense to hire an Australian director and DOP to steer the project. While on the surface Safe Harbour and The Cry are very different stories, Ivin says they are united by the morale ambiguity of their leading characters. In the first episode of The Cry, while you sympathise with Joanna and Alistair’s struggle to cope with their baby’s incessant crying, it’s never made clear whether they are good or bad people. Aside from the time difference between Australia and the UK, which ranged from nine to 11 hours depending on daylight savings, Mundell says the biggest challenges of the project were differing working practices, Australia’s union system and a fluctuating exchange rate, with Australia proving more expensive than the UK. Across the four episodes, the plot unfolds across multiple timelines, jumping between past and present as it shows how Joanna and Alistair first meet, as well as into the future, where scenes tease Joanna facing an unruly mob as she is put on trial for an as-yet-unknown crime. “There’s definitely a feeling through the series is that it’s a show that keeps its cards very close and then starts revealing them as the episodes go on,” Leslie says. “So you’re very aware when you’re doing a scene of what information you might have that certain other characters might not have and, on top of that, information that the characters have that the audience doesn’t have. Ivin admits there’s a fine line between intrigue and confusion, so was careful not to splinter the storytelling too haphazardly, with match cuts often linking two different timeframes. That being said, playing scenes out of order means viewers can immediately sense something will happen later in the story, driving up the tension until those events unfold. 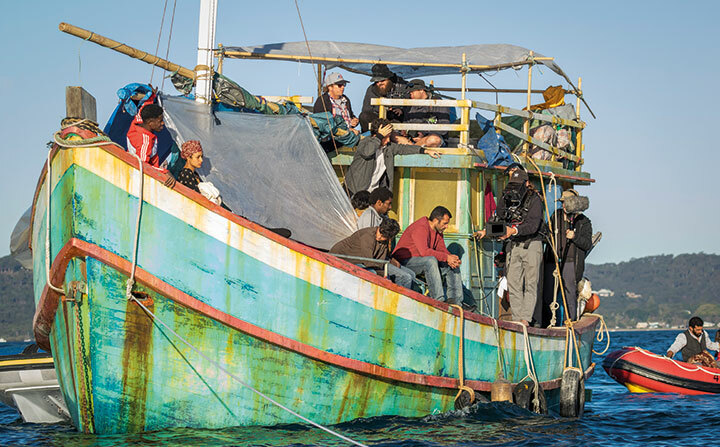 Commissioned by Australian pubcaster SBS, miniseries Safe Harbour offers a fresh perspective on the global refugee crisis. DQ sits down with the on- and off-screen talent behind the show to find out more about this ‘very cinematic’ piece of television. Ivin seized the chance to avoid those caricatures when he was hired to direct Safe Harbour, a four-hour psychological thriller commissioned by Australian pubcaster SBS. Produced by NBCUniversal’s Matchbox Pictures, the miniseries tackles the controversial topic of asylum seekers and the moral dilemmas they pose to governments, societies and individuals, particularly in the West. The plot follows five vacationing Australians who set sail on a yacht bound for Indonesia. En route they encounter a broken-down fishing boat full of desperate asylum seekers. Despite concerns that the Aussies could face charges of people-smuggling, they agree to tow the stricken vessel back to Australia, but by the next morning it has vanished. Five years later they meet some of the refugees and discover someone had cut the tow rope, resulting in the loss of seven lives. The relatively unknown Nicole Chamoun and Hazem Shammas play Zahra and Ismail, an Iraqi couple whose nine-year-old daughter dies after the vessel sinks. Robert Rabiah is Ismail’s brother Bilal. Australian-born Chamoun, whose parents emigrated from Lebanon during its civil war, made her screen debut in the SBS series Kick in 2007 and more recently appeared in December Media’s The Doctor Blake Mysteries and Sticky Pictures’ Ronny Chieng: International Student, both for pubcaster the ABC. After a lot of hard work and perseverance, Chamoun’s star is rising: she also plays a Muslim university student who gets embroiled in race riots in Melbourne in Roadshow Rough Diamond’s Romper Stomper, an original series commissioned by streaming service Stan that debuted in Australia on January 1, 2018. Ivin was similarly impressed with the performances of Shammas, an experienced stage actor whose screen credits include Screentime’s Underbelly and ABC comedy At Home with Julia, and Rabiah (Screentime’s Fat Tony & Co, Matchbox Pictures movie Ali’s Wedding). The producers secured marquee names to play the Aussie holidaymakers. Ewen Leslie (Top of the Lake: China Girl, Rake) plays Ryan, the boat’s captain, with Phoebe Tonkin (The Originals, The Vampire Diaries) as his sister Olivia and Leeanna Walsman (Seven Types of Ambiguity, Cleverman) as his wife Bree. Joel Jackson (The Wrong Girl, Peter Allen: Not the Boy Next Door) is Damien, Olivia’s boyfriend who disappears after the incident on the water and reappears at a group reunion five years later. Jacqueline McKenzie (Love Child, Hiding) is the fifth passenger, a lawyer named Helen. 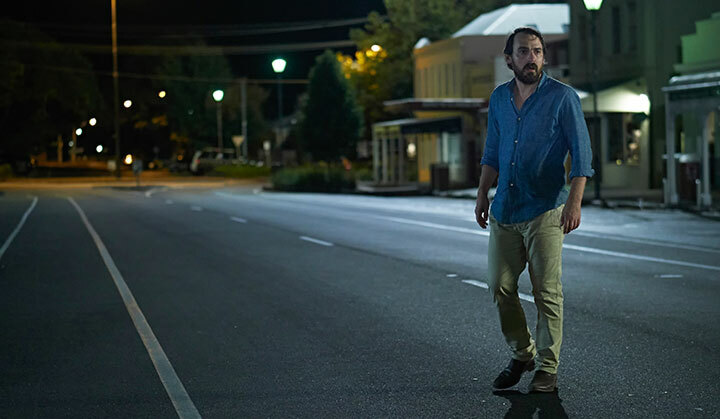 Filmed over six weeks in Brisbane and off the Queensland coast, Safe Harbour is co-funded by Screen Australia, Screen Queensland, SBS and NBCUniversal International Distribution, which has international rights. The series is due to premiere on SBS next Wednesday. The concept was one of 300-plus ideas that flooded in after Matchbox Pictures opened an office in Brisbane in 2015 with the support of Screen Queensland and issued a general call-out for stories. Matchbox development executive and producer Stephen Corvini says the two-page treatment from neophyte writers Phil Enchelmaier and Simon Kennedy for the project, then titled Asylum, was the standout. Corvini held a brainstorming session in Brisbane with Enchelmaier, Kennedy and experienced writers Beatrix Christian and Anthony Mullins, who runs Matchbox’s Brisbane office. Christian subsequently dropped out to co-write FremantleMedia Australia (FMA)’s Picnic at Hanging Rock for Foxtel, so Belinda Chayko and Kris Wyld came aboard and a series bible was written. Wyld then moved on to create and co-write medical drama Pulse for the ABC and Matt Cameron was hired. Chayko had worked with Cameron on Matchbox’s miniseries Secret City for Foxtel and the prodco’s drama series Old School, which starred Sam Neill and Bryan Brown, for the ABC. Corvini subsequently pitched the project to SBS head of drama Sue Masters, who readily agreed to fund the script development. After four scripts had been written, SBS gave the greenlight and Screen Australia and Screen Queensland provided production funding. SBS adopted the four-hour drama template with FMA’s Better Man, which Corvini produced, followed by Essential Media and Entertainment’s The Principal, Blackfella Films’ Deep Water, Easy Tiger/Carver Films’ Sunshine and, also premiering in 2018, Subtext Pictures’ Dead Lucky. “It’s creatively challenging – you feel like a start-up company every time you do one of these four-hours because they are all different. But we feel it is an efficient use of our money, and it’s important to have some marquee stars so that our projects can stand out,” Masters adds. Chayko wrote episodes one and four and co-wrote episode three with Enchelmaier. Cameron did episode two. The plotting was a collaborative process involving all the writers plus Kennedy, Mullins and Corvini. Chayko sees one virtue of four-part dramas as the ability to tell stories that in the past might have been the subject of theatrical features. Ivin, who directed Seven Types of Ambiguity and the US cable series Hunters for Matchbox as well as numerous other dramas including The Beautiful Lie, Gallipoli and Puberty Blues, heard about the project on the grapevine. The director adds that the ambiguity of the moral dilemma at the heart of the story was the key to the drama. “I did not want it to be a for-or-against story,” he says. “We’re talking about the issue of asylum seekers, which could be anywhere in the world. From the outset, this felt like a way of contributing to and discussing this really important issue without it becoming a piece of advocacy. Tonkin jumped at the chance to come back to Australia to work on a grounded drama after spending years on the heightened-reality milieu of The Originals and The Vampire Diaries. The actor relished tackling her character’s arc from being a hopeful, happy young woman to someone who, five years later, harbours a lot of anger, guilt and sadness. Working for the first time with veterans McKenzie, Leslie and Walsman, Tonkin says she was a bit intimidated initially but felt comfortable after the first day and enjoyed the collaborative effort. “It was incredibly inspiring to work with all those actors; I probably learned more than I did in the past 10 years,” she says. McKenzie describes her character as an embittered, driven and ambitious woman who is nearly unhinged after the tragedy at sea. Thereafter, she sets out to save her soul. 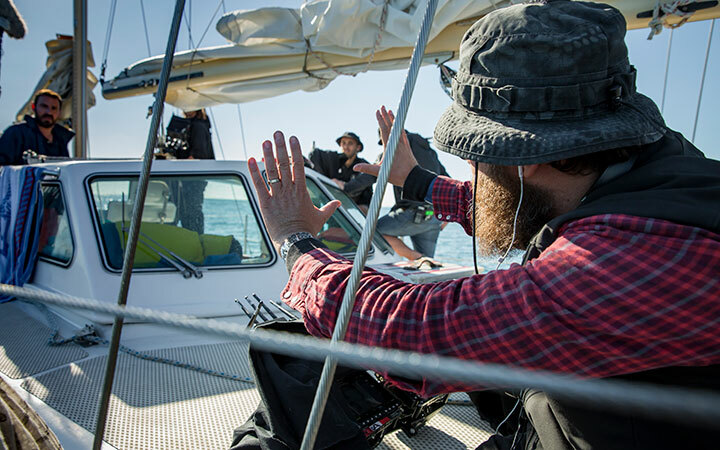 Like most of the cast and crew, Leslie found the week-long shoot on two boats and six support vessels off the coast of Brisbane challenging, especially playing the boat’s captain with zero maritime expertise. He was cracking Jaws and Waterworld jokes before venturing out to sea but quickly desisted. Leslie was attracted to the project because all the characters are complex and make bad decisions over the course of the four episodes, and by the chance to work with Ivin for the first time, having followed the director’s career since 2003 short film Cracker Bag. He also enjoyed teaming up again with Jackson after they collaborated on the Foxtel-commissioned First World War miniseries Deadline Gallipoli. 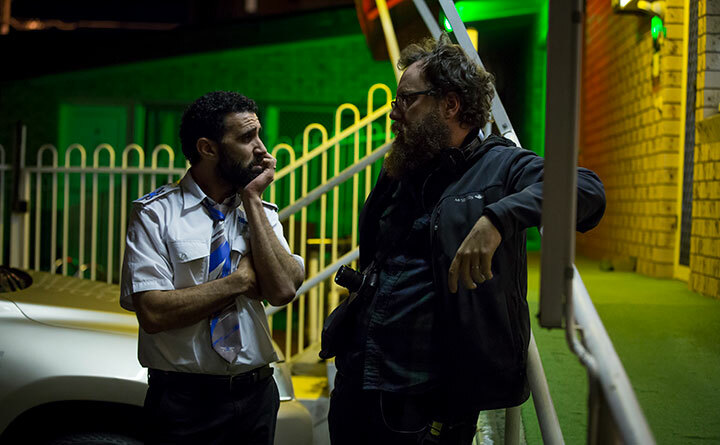 Ivin is full of praise for the work of first-time cinematographer Sam Chiplin, who had been the B camera operator on The Beautiful Lie, a reimagining of Tolstoy’s Anna Karenina produced by John Edwards and Imogen Banks for the ABC. Before that, Chiplin was a director’s assistant at TVC production house Exit Films, where Ivin met him. 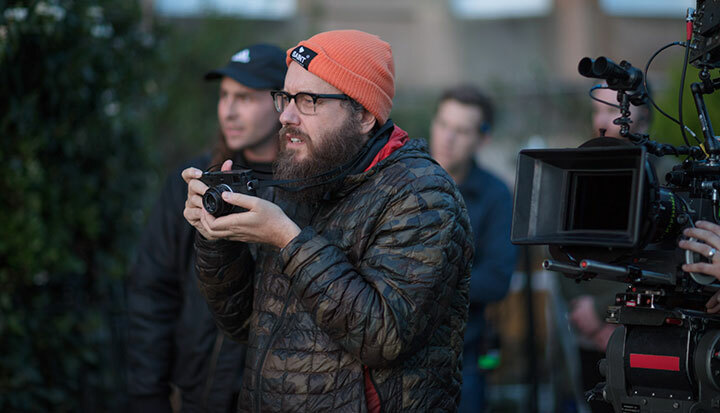 “He created an amazing aesthetic on the show,” says the director, adding that he had only seen that level of enthusiasm and attitude in two other people: Australian DoPs Greig Fraser, whose movie credits include Lion, Mary Magdalene, Rogue One and Foxcatcher, and Adam Arkapaw, who shot the first series of Top of the Lake, True Detective and features including Assassin’s Creed and The Light Between Oceans.